When The Match That Would Not End finally did, at 70-68 in the fifth set, after a record 11 hours, 5 minutes spread over three days, the customary handshake between opponents simply would not suffice. So when John Isner of the United States won the longest match in tennis history and went to the net to greet Nicolas Mahut of France, who — for lack of a better word — lost Thursday at Wimbledon, Isner pulled Mahut in for a hug. 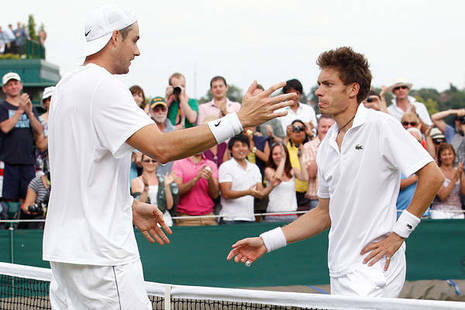 John Isner of the United States outlasted Nicolas Mahut of France, 70-68, in the fifth set of their epic three-day first-round match at Wimbledon on Thursday. In an astonishing display of endurance, the players fought for 11 hours and 5 minutes, breaking all records for length of match, games played, and aces served. When it ended, the All England Lawn Tennis Club awarded bowls of commemoration to the players and the chair umpire, Mohammed Lahyani of Sweden. John Isner won the longest match in tennis history Thursday, taking the fifth set against Nicolas Mahut 70-68 in an epic struggle that stretched over three days and 11 hours. The American closed out the victory with a backhand passing shot, then collapsed to his back as he tossed his racket in jubilation and relief. The final score of the first-round match read: 6-4, 3-6, 6-7 (7), 7-6 (3), 70-68. When John Isner finally won the longest match in tennis history, he collapsed on the Wimbledon grass and then summoned one last burst of energy, springing to his feet to give his opponent a bear hug. Isner hit a backhand up the line Thursday to win the last of the match's 980 points, and he beat Nicolas Mahut in the fifth set, 70-68. The first-round marathon took 11 hours, 5 minutes over three days, lasting so long it was suspended because of darkness — two nights in a row. Play resumed Thursday at 59-all before an overflow crowd on cozy Court 18 and continued for 20 games and 65 minutes before Isner won.